Lipsky had her first solo exhibition in a university art gallery in 1968. Two years later, she showed her work with the Andre Emmerich Gallery in New York. Uncompromisingly abstract, these canvases were enthusiastically received. In response to her debut at Emmerich, Noel Frackman wrote of “ripples of luscious, sensuous color.” At the edges of Lipsky’s canvas, her shapes “lick out like flames and there is an incendiary vividness in the impetuous yet directed forms.” One might wonder how rippling, presumably liquid forms could be flame-like, but that is a quibble swept away by the brilliance—the “sheer splendor,” in Frackman’s phrase—of the artist’s palette.2 If the purposes of art criticism include revealing the complexity of the critic’s experience, then inconsistency has its uses. In this case, the easy transition from water to fire, from rippling to flickering color, points to the capaciousness of Lipsky’s imagery. In the New York art world of the 1960s, however, certain critics declared that it is not enough to present an inventory of an artwork’s qualities. One must make judgments of taste. The leader of this critical contingent was Clement Greenberg. Lipsky met Greenberg early in her career. Impressed by his intelligence, she agreed with his emphasis on aesthetic judgment. Perhaps one’s criteria “can’t be put into words,” he told her, yet they must not be suspended.3 To underpin specific judgments with a general rationale, Greenberg articulated a theory of progress in art. A medium advances, he claimed, by dispensing with all but its formal essence. In the case of painting, only color is permissible: not line or delineated form or tonal contrast. Moreover, color must be deployed in ways that produce spatial effects sufficiently “optical” to exclude images of tangible things.4 Greenberg proposed a utopia for vision, a realm where the act of seeing could achieve purity. It is understandable that he was drawn to the high-keyed color in Lipsky’s paintings. And understandable, too, that she appreciated the insights and speculations that preceded his judgments on contemporary art. Unconverted to his theory about painting’s exclusively visual essence, she never strove for Greenbergian “purity,” which is, in fact, unobtainable. As we engage with the paintings Lipsky made in the late 1960s and the ’70s, there is no question of detaching vision from our other faculties. Our visual responses are powerful in part because they are interwoven with an empathetic sense of the painter’s physical energy and grace. Her paintings are beautiful and their beauty addresses the viewer as a complete being, not as a pair of eyes on the lookout for some theoretically-defined essence. Caught up in the currents of Springs Fireplace or Good Firefly, 1970, we feel the sweep of Lipsky’s arm as she spreads her pigments over the canvas. And we endow the resulting surges of color with a vitality of their own as they reach from edge to edge. Lipsky’s images feel resolved but never inert. The more one looks, the more one finds. Paint spatters are dramatic traces of the artist’s high-risk method. Subtler ones are to be found in the varied density of her pigments. Equally subtle are the shifts in tone that keep a color alive and negotiate its relations with neighboring hues. As our focus shifts, Lipsky’s paintings renew themselves, for there is no way to summarize them. A useful contrast is to be seen in Frank Stella’s early black paintings, which invite summarization. Working in a deliberately inexpressive, non-gestural manner, Stella covered his canvases with black stripes, each as wide as all the others. Deriving their width from that of the painting’s stretcher bars, he laid them on in symmetrical patterns. Writing of the aluminum stripe paintings that followed the black ones, Michael Fried argued that their symmetries “appear to have been generated by the framing-edge and, starting there, to have taken possession of the rest of the canvas.”5 From a physical premise (“the framing-edge”) the image follows, as if by logical necessity. Though the contrast with Lipsky’s process is clear, it should not be reduced to a schematic stand-o between thought and feeling. Her richly felt imagery is rife with a pictorial logic to be glimpsed in her choice of colors, in the varying widths of her wavy bands, and in the placement of the overall image within the edges of the canvas. The point is that we cannot extricate her thinking from her feeling and would be well advised not to try. For her, as for most artists over the years and centuries, there is no distinction between the two. So it is all the more remarkable that Stella’s black paintings of the late 1950s introduced a period during which many artists and critics in New York believed that thought could be extracted from intuition in all its elusiveness. It was believed, further, that art would advance only if it learned to take guidance from concept. Amid the frenetic innovations of the 1960s, she found that her background had immunized her against the allure of art-world trends. Growing up in Manhattan Beach, Brooklyn, she took art lessons and, at the age of ten, was liberated from her narrow notions of representation when an instructor pointed out to her that the sea need not always be rendered in blue. There could be a bit of green, of red, of yellow. He was, she says, “talking to me like I was a Seurat follower.”7 With her parents, Lipsky visited the Whitney Museum of American Art and the Museum of Modern Art. At the Modern, she was especially impressed by Robert Delaunay’s Simultaneous Contrasts: Sun and Moon, 1913, with its intersecting discs of high-keyed color. As a teenager, she attended an adult class at the art school of the Brooklyn Museum, where the teachers included Max Beckmann and Moses Soyer. She also studied painting at Lincoln High School, which had an art department that Lipsky remembers as “very good” but not always encouraging. When she asked a teacher about Scholastic’s National Art Award, she was told not to bother. Submitting a portfolio of her work, anyway, she won first prize and a scholarship o er from Miami University. During Lipsky’s high school years, museum collections and art classes had supplied her with a map of modernism. She could trace with ease the path from Impressionism to Paul Cézanne to Cubism and its Orphic variants in the paintings of Robert Delaunay. She was familiar with the paintings of Max Beckmann, Kurt Schwitters, and Paul Klee. The modernist past had primed her to enter the present and be stunned not only by Rothko’s large canvases, but also by the work of Helen Frankenthaler, Kenneth Noland, and other unreservedly abstract painters. She was ready to be liberated by abstraction itself. After receiving her degree at Cornell, Lipsky enrolled in the Master of Fine Arts program at Hunter College on Manhattan’s Upper East Side. Still painting figuratively, she was working in a style she has described as “a combination of Matisse and German Expressionism.” One of her instructors was the sculptor and architect Tony Smith, who became her next mentor. Recommending abstraction, he explained that representational painting can illustrate feelings but only abstract imagery can express the feelings themselves—“real feelings.”9 Lipsky had experimented with abstract imagery a few years earlier at the Art Students League.10 With Smith’s encouragement, she now embraced it and, soon after receiving her MFA degree, she joined the Emmerich Gallery, had her first solo in Manhattan, and found herself gathered under a new label: Lyrical Abstraction. 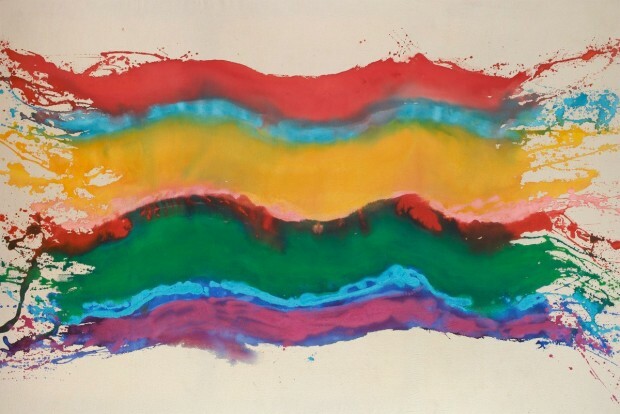 Appearing in 1969 as the title of an exhibition organized by Larry Aldrich, the phrase “Lyrical Abstraction” was intended to distinguish a new generation of painters from three sets of immediate predecessors: the Minimalists; the color-field painters, including Frankenthaler and Morris Louis; and the Abstract Expressionists. In contrast to the often gritty, even aggressive, imagery of Abstract Expressionism—as epitomized by the work of Willem de Kooning and Franz Kline—Lyrical Abstraction tends toward bright color and moods ranging from serenity to exuberance. Though its palette gave this new work certain a inities with color-field painting, there was an important difference. Frankenthaler and the other color-fielders could be seen as striving for the “purely optical” space that Greenberg had posited as essential to a painting’s success. By contrast, most of the Lyrical Abstractionists were acquainted with Greenbergian theory but felt no need to conform to it. Opening early in 1970 at Aldrich’s museum in Ridgefield, Connecticut, Highlights 1969-70: Lyrical Abstraction was seen at the Phoenix Art Museum later that year and at the Whitney Museum in 1971. Here, it seemed, was the latest wrinkle in the new arriving right on schedule. Yet “Lyrical Abstraction” did not name an art movement on the familiar avant-garde model. It was, rather, a catch-all term applied to a large group of young painters dubious about the idea of theorizable aesthetic progress. Given that the faith in progress had led to the vacuous extremes of conceptual art, their doubts were reasonable. Determined to be of their moment without capitulating to the dogged call for avant-garde innovation, the painters Aldrich chose for his exhibition saw painting as the medium of a perennially renewed tradition, an address to the present in the light of a long and challenging past. A strong opponent of art-as-fashion, Lipsky deplores the way “novelty” preoccupied the art world in the wake of Pop and such innovations as performance art.12 Her judgment is persuasive and yet it must be said that not all change is merely fashionable. “Something in the air”—something other than a yen for the next new thing—did indeed prompt the so-called Lyrical Abstractionists to emerge in New York as the 1960s ended. Early in the following decade, Willis Domingo made a sober attempt to say what that “something” was. There may be a confirmation of Domingo’s last point in the title of a painting Lipsky made in 1971. It is called Rosy Fingered Dawn, a phrase she borrowed from Homer. De Kooning borrowed it, too. His painting, Rosy Fingered Dawn at Louse Point, 1963, attaches the Homeric epithet to a stretch of shoreline at the eastern end of Long Island. And it is possible to read the depths of a luminous landscape into de Kooning’s image. Figurative intimations are to be seen here, too, for a residue of representation lingers in this painting, as in nearly all his abstractions—a feature of de Kooning’s art that Greenberg found unacceptable. In the critic’s view, de Kooning was clinging to formal devices— line, volume, traditional special effects—that blocked the way to the optical purity his theory demanded. Despite Lipsky’s respect for Greenberg, she disagreed with his judgment that de Kooning could be dismissed as retardataire: a late-Cubist masquerading as an innovator. Lipsky had admired de Kooning ever since she came across his Door to the River, 1960, on an early foray to the Whitney. A teenager then, and still painting figuratively, she was nonetheless fascinated by the abstract images de Kooning built from his vigorously gestural brushwork. Because her first mature paintings are gestural, too, it is tempting to see her early appreciation of the older painter as prophetic. Though art writers have long distinguished the linear from the painterly— contrasting, for example, the brushier extremes of the Rococo with the severities of Jacques-Louis David’s Neoclassicism—the differences between the two styles of painting were not codified until 1915 in Heinrich Wöllin’s Principles of Art History. During the High Renaissance, he observes, painters’ forms were clearly outlined and thereby distinct from one another. Casting about for an epitome of the linear painter, Wöl lin settles on Albrecht Dürer. Opposite Dürer stands Diego Velázquez, a painterly painter of the Baroque period who sacrifices clarity to ambiguities generated by an “apprehension of the world as a shifting semblance.”14 The surfaces of Dürer’s paintings are smooth. The most casual glance at Velázquez’s pictures reveals traces of his brush, yet his imagery looks almost linear in comparison to that of late Rembrandt or, in the eighteenth century, the work of Honoré Fragonard. These painters do not merely blur the outlines of objects and fill their pictorial light with flickering equivocations. Putting their facture on display, they invite us to pay close attention to the subtlest textures of their brushwork. The splashier German Expressionists count as painterly painters, as do Chaim Soutine and Francis Bacon. De Kooning is, of course, a prominent figure in these not very orderly ranks and one of the precursors who had an impact on Lipsky as she was finding her way to an idea of herself as an artist. Others included Rothko, Barnett Newman, and—perhaps the most important— Pollock, who had been a friend of Tony Smith and was a frequent subject of his discussions with Lipsky. Among the many questions that led her along the path to her first mature paintings was one asked by very few other painters in New York: how does one learn from the Abstract Expressionists’ gesture without becoming, merely, their disciple? To see the originality of Lipsky’s answer to this question, we must first look at the way gesture works in Abstract Expressionism and in painterly painting generally, whether abstract or figurative. First, a brushstroke asserts its distinctive blend of form, color, and texture. Then it reaches beyond itself, so to speak, to become part of something larger—a facial feature in a Rembrandt portrait or, in a de Kooning painting like Rosy Fingered Dawn at Louse Point, an allusion to some feature of the earth or the sky. Turning to Lipsky’s Chrysanthemum, 1971, we see something similar but crucially different. With her wet-sponge method, she fuses individual gestures into large, curving shapes, each its own shade of blue, greenish-blue, red, or watery pink. Because these shapes are nested and she has blurred their borders, they form a unity. This is new: a painterly image that is not made of singular gestures but is itself gestural. The color-bands of Chrysanthemum flow horizontally, those of utterfly are vertical, yet they claim the pictorial surface with the same e ortless panache. In both, the spattered extremities of the bands come to elegant, unforced terms with the corners and edges of the canvas. Afloat within the frame, Lipsky’s colors seem indifferent to gravity. These paintings — Butterfly, especially — could be reoriented on the wall and lose none of their visual rightness. Faint but definite, a feeling of landscape pervades Blue Wind, 1971, and so it is not as versatile. This is a decidedly horizontal painting and thus it has an a inity with certain of Helen Frankenthaler’s early works. Looking past Frankenthaler to the Abstract Expressionists, Pollock comes into view—a painter as important to her as, a generation later, he was to Lipsky. Fifteen years old when she first discovered Pollock’s dripped and poured paintings, Lipsky remembers being “mystified.” More than that, she “felt dizzy.” Not until her college years, when she was coming face to face with a wide range of contemporary abstraction, did she feel what she calls the “intimacy” of Pollock’s sprawling fields of pigment. She also grasped the “order” in his art, which even now eludes many viewers.15 For Pollock did not build pictorial structures of the kind that have, since ancient times, arranged the elements of an image in a harmony that subordinates small elements to larger ones and unites them all in what used to be called a stable composition. There is no such stability in a Pollock painting. Order in his webs of color is improvised, local, and elusive, hence the vertigo induced by Lipsky’s first meeting with his imagery. Later, having assimilated Pollock’s innovations, she moved on to innovations of her own. Pollock’s gesture covers the canvas with a flickering, expanding field of energy. As we’ve seen, the colors in Lipsky’s paintings resolve themselves into unitary forms. Yet her energies are also expansive, and that is why scale in her work from the late 1960s and early ’70s is so flexible. Lush and sometimes barely perceptible hues swim along the borders where Lipsky’s currents of pigment meet. Drawn close to the canvas by these nuances, we feel scale becoming intimate. Stepping back, we see how assuredly these paintings hold the wall. Their scale is now immense. An account of Lipsky’s pictorial means and methods highlights her preeminence within her generation. She was the most promising and, ultimately, the most original of the Lyrical Abstractionists. But how do we go beyond formal description to the meaning of the forms described? When the subject is gestural painting, this question is not always asked, as if it were enough simply to register the visual impact of painting as striking as Lipsky’s. Yet the question persists. What are these gestural forms of hers getting at? An answer might begin with those Renaissance connoisseurs who came to prize drawings because they reveal, more directly than finished paintings, qualities of the artist’s hand. As it happens, this interest developed much earlier. Writing in the first century, A.D., Pliny the Elder remarked that “the last works of artists and their unfinished pictures … are more admired than those which they finished because in them are seen the preliminary drawings left visible and the artists’ actual thoughts.”16 The hand’s traces give evidence about the individual whose hand it is. Pliny sought signs of the artist’s thinking. Renaissance eyes focused on gesture to find clues to personality. In the Romantic period, this focus turned obsessive under the influence of a new idea: to create art was to express and, perhaps, create oneself. Everything in a painting, from its surface texture to its formal structure, is to be understood as a revelation of the painter’s nature—and of the artist’s unity with external nature. In Lipsky’s art, evocations of the natural world are oblique. There is nothing firefly-like in The Good Firefly, 1970, except for a glow that appears as well around the edges of Butterfly, in the heart of Chrysanthemum, and in the name of Glowing, 1970. Each of these paintings draws us into the extended, exuberant moment of its creation—a moment recalled and, in a way, relived as we intuit the artist’s power to reconcile uninhibited spontaneity with disciplined judgment. The result is the image Lipsky unfurls across the canvas in all the clarity of its complexity. We can, of course, see her clarities in strictly formal terms and, yet, the tradition to which these works belong—the tradition of painterly painting—invites us to see them as manifestations of the artist herself. Accepting the invitation, we face a question: which of the artist’s inward qualities animates a painting like Firefly? Finding a degree of independence from one other, the colors in Wooster, 1974, record the pulse of the artist’s gesture and render visible the seismic subtleties that Lipsky’s blending renders nearly invisible in earlier paintings. Separate or merged, her color-bands, until now, have been organized by a limber parallelism. In JJ Flowers, 1974, that pattern prevails on the right-hand side of canvas but not on the left. Here, patches of pink and bright green float free, coalescing in an arrangement very like a composition. Though the play of compositional balance and counter-balance is more complex in 6th Avenue, 1975, Lipsky clarifies it by laying a grid over her colors. With paintings like these, she makes a stately turn toward the grandeur and refinement of her later work. Lipsky emerged in the forefront of a generation of painters determined to resist the widespread assumption that the medium of paint on canvas was obsolete. Her early paintings have the passion of an embattled moment, a passion still to be felt when we view these works against the backdrop of all that was developing in the New York art world as the 1960s gave way to the 1970s. That passion deepens when we enlarge the backdrop to include painting’s long history. For Lipsky’s gesture has its larger meanings when we see it as realizing possibilities inherent in the very act of painting. These possibilities are perennial, as enduring as the moment of her art-world entry was fleeting. No wonder she admires Baudelaire’s comment on the double nature of beauty. It has, he said, “an eternal, invariable element” and a “circumstantial element” that reflects the contingencies of the time in which it appears.18 In Lipsky’s art, these elements are seamlessly united. Pat Lipsky, The Right Color, A New York Studio School Lecture, 2009. Noel Frackman, “Pat Lipsky at Emmerich,” Arts Magazine, Summer 1970, p. 67. Clement Greenberg, quoted by Pat Lipsky in What Tony, Lee, and Clem Told Me, 1995. Clement Greenberg, “Louis and Noland” (1960), The Collected Essays and Criticism, 4 vols., ed. John O’Brian, Chicago: The University of Chicago Press, 1993, vol. 4: Volume 4: Modernism with a Vengeance, 1957-1969, pp. 95-97. See also Clement Greenberg, “Modernist Painting” (1961), reprinted in Art in Modern Culture: An Anthology of Modernist Texts, eds. Francis Frascina and Jonathan Harris. New York: Phaidon Press, 1992, pp. 30814. Michael Fried, “Shape as Form: Frank Stella’s Irregular Polygons,” Art and Objecthood: Essays and Reviews, University of Chicago Press, 1998, p. 79. Pat Lipsky: An Interview, 2013, Linea: The Artist’s Voice. “Pat Lipsky: An Interview,” Linea: The Artist’s Voice. Larry Aldrich, “Young Lyrical Painters,” Art in America, November-December 1969, pp. 104, 107. Willis Domingo, “Color Abstraction: A Survey of Recent American Painting,” Arts Magazine, December 1970-January 1971, pp. 34-39. Heinrich Wöl lin, Principles of Art History (1915), New York: Dover Publications, 2012, pp. 14, 20, 47. Pliny the Elder, Natural History, Volume IX, Books 33-35, tr. H. Rackham, Cambridge, Massachusetts: Harvard University Press, Loeb Classical Library, 1952, p. 367. Charles Baudelaire, “The Painter of Modern Life” (1863), The Painter of Modern Life and Other Essays, ed. Jonathan Mayne, London: Phaidon, 1963, p. 3. Lipsky paraphrases Baudelaire’s comment in the LINEA interview.